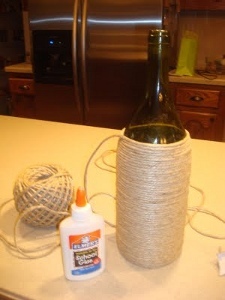 This hemp wrapped wine bottle from Jane Bernard is one of the coolest, easiest things to make with wine bottles. 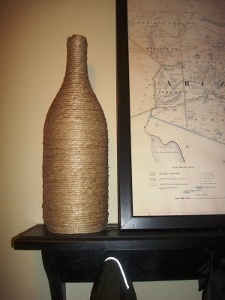 Recycle your empty bottles into stylish home decor using little more than glue and hemp cording. I started this project with tacky glue, but quickly realized that good ole' Elmer's glue works better. It doesn't set up as quick and gives you more time to make any adjustments to your rope. 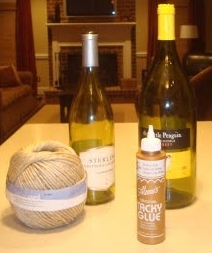 I started the rope at the bottom of the bottle and glued every other time I wrapped the rope around the bottle. 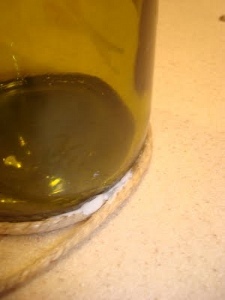 The bottom section of the bottle is where I used the most glue. The middle I used much less. And the top where the bottle gets smaller I used more glue again to keep the rope from gaping and showing the bottle underneath. 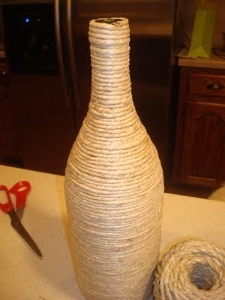 I've seen my sister work on wine bottle crafts like these before and it was the base of the wine bottle that needs alot of glue and careful wrapping but the middle section is easier and you don't even need to use glue if you wrap the rope tightly and close. You can decide to space the rope but you'll need to use glue to make it stick to the bottle. #BestIdeaEver I love this. It reminds me of the sea for some reason. I want to put it with my other ocean sea decorations I have set up in my home.